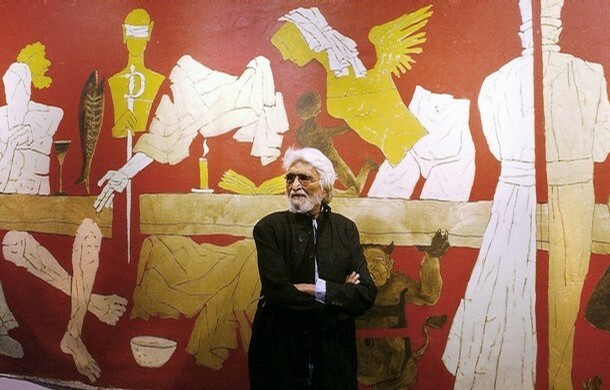 – Maqbool Fida Husain is an artist of Indian origin. – According to Forbes magazine, he has been called the “Picasso of India”. – He has been awarded the Padma Bhushan in 1973 and was nominated to the Rajya Sabha in 1986. – He was awarded the Padma Vibhushan in 1991. – Husain is among the highest paid painter in India. His single canvases have fetched up to $2 million at a recent Christie’s auction. After legal cases and death threats in his home country, he was on a self imposed exile from 2006. In January, 2010, he was offered the citizenship of Qatar, which he accepted. view,the baseline in this sample may appear to slant down but this is not actually true(in context of surface on which it is written). 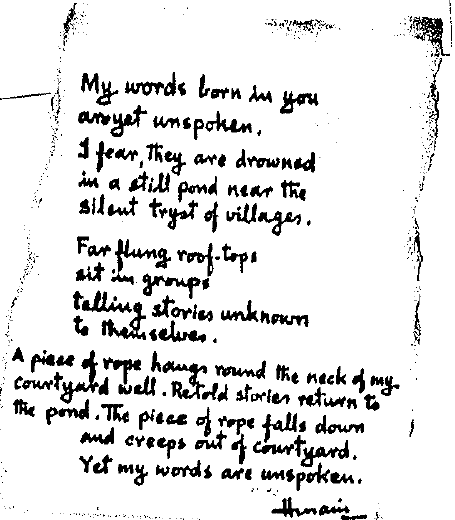 This Handwriting Sample of M.F. 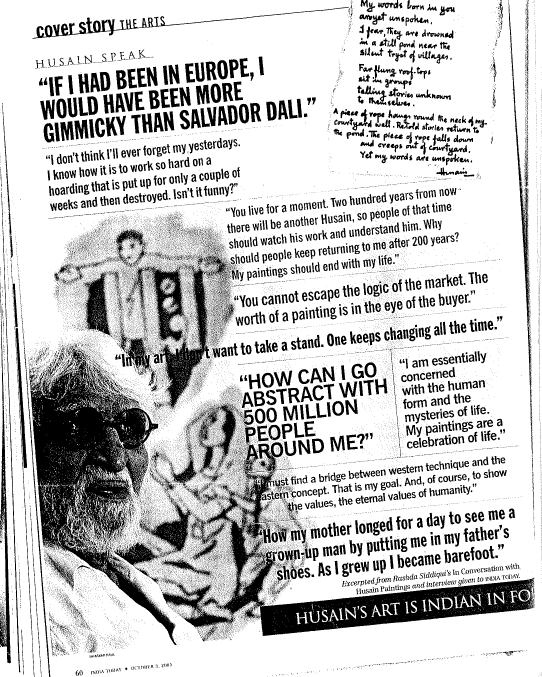 Husain appeared in the Magazine India Today print version (Dated 3rd-Oct-2005), which ran a feature on M.F.Husain. M.F Husain is more judgmental in his decision making without much influence of his emotions. He makes decisions by thing what is best for him in a given circumstance and won’t get pushed around emotionally by other people. He is quite objective in nature and given to evaluation facts before taking decisions. He is ruled by his head and not entirely by his heart. He is a cool, collected person. Some may see him as an unemotional person. He does have emotions like all the humans but feels no need to express them. He is kind of withdrawn into himself and enjoys being alone. He is a very level headed person and will remain calm in emergency situations. He is never quite impulsive. He has a very deep and enduring feelings. Any emotional situation or feeling generally stays with him for a long time. He has definite likes and dislikes. He is a person who feels situations intensely. I believe this is one trait that is essential to being a successful artist. Unless an artist is able to feel the situation intensely, he/she won’t be successful in portray it as a piece of art. He has a tremendous ability to focus on any project/task that he takes on. When he is focusing on some project then he forgets everything else that’s happening around him. He has the ability to eliminate all outside noises, thoughts, interference, and ability to concentrate on one subject. When he concentrates, he becomes oblivious to everything around you. For an artist to be successful, ability to focus is the key.This is what gets the best thoughts. He is the one having Curious/Investigative as well as Creative thinking patterns. Having multiple thinking patterns helps him to do justice to the tasks involving fast thinking/decision making as well as slow creative generation of ideas. He has an amazing ability to align his thinking patterns based on the situations. Probably that is one of the reasons that makes him a great artist and film maker and every other tasks he takes. He thinks/creates much like a brick mason, stacking fact-upon-fact. However, the thought pattern is not complete until the last fact is in place. He constructs things and picture them in his mind. He tends to learn more quickly with demonstration rather than by reading instructions. But one every good thing is that once the knowledge is there, it stays with him forever.. He sifts and examines facts, he has this ability to consider the pros and cons. He interprets all the facts by separating them, breaking them down, and organizing them from a critical point of view. He does possess a strong reasoning ability. Being a Curious thinker, he thinks rapidly if required by a situation. He can take say ten good ideas and quickly formulate into one idea that works. He is a practical person whose goals are planned. He has this innate desire for well-defined goals. He has an ability to view the end of the project at the beginning (before he starts). Everything he does is mapped out- the entire route he is going to take. He plans everything in advance and finds joy in anticipation. This ability helps him in his profession as an artist as well as a film maker. He exhibits tremendous will-power that helps him achieve his goals in-spite-of any difficulty he faces. He exhibits extreme attention to details. He is an observant person and notices everything. He tends to have a good memory. He has this fine ability to create smooth-running order out of chaos. He tends to organize his time, work pretty well. This is an ability that helps him handle multiple tasks well. He has the ability to express his ideas smoothly and easily, moving from one subject to another with ease. He exhibits fluidity of thoughts and that makes him a good speaker and writer. He is a kind of person who doesn’t like beating around the bush and likes “to-the- point” communication. He is quite selective in the choice of his associates and limits the close, intimate friends to only a few. He is always honest and blunt when asked his opinions. 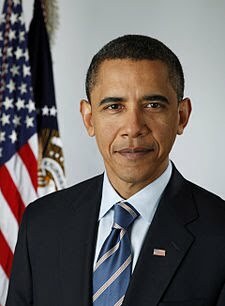 – He is the first African American to hold the office. – Obama is a graduate of Columbia University and Harvard Law School, where he was the president of the Harvard Law Review. – On October 8, 2009, Obama was named the 2009 Nobel Peace Prize laureate. – Besides his native English, Obama speaks Indonesian at the conversational level, which he learned during his four childhood years in Jakarta. Obama tried to quit smoking several times over the years and has used nicotine replacement therapy. However in June 2010, during a congratulatory phone call to president-elect Benigno Aquino of the Philippines, Obama told Aquino that he had quit and would offer advice on how to stop smoking when Aquino was himself ready for that step. 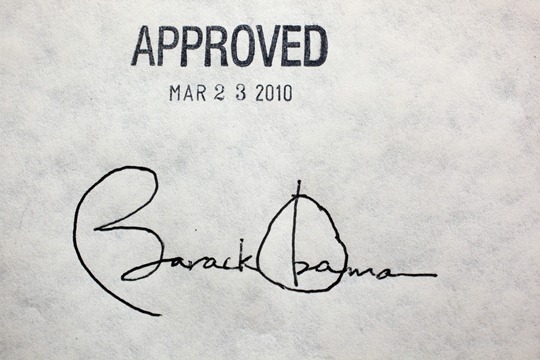 This Signature is of President Barack Obama signing the historic healthcare bill at the White House. What may surprise you is the fact that Obama used not one, or two, but 22 different pens to sign this history bill. The pen used to sign historic legislation itself becomes a historical artifact. The more pens a President uses, the more thank-you gifts he can offer to those who helped create that piece of history. The White House often engraves the pens, which are then given as keepsakes to key proponents or supporters of the newly signed legislation. 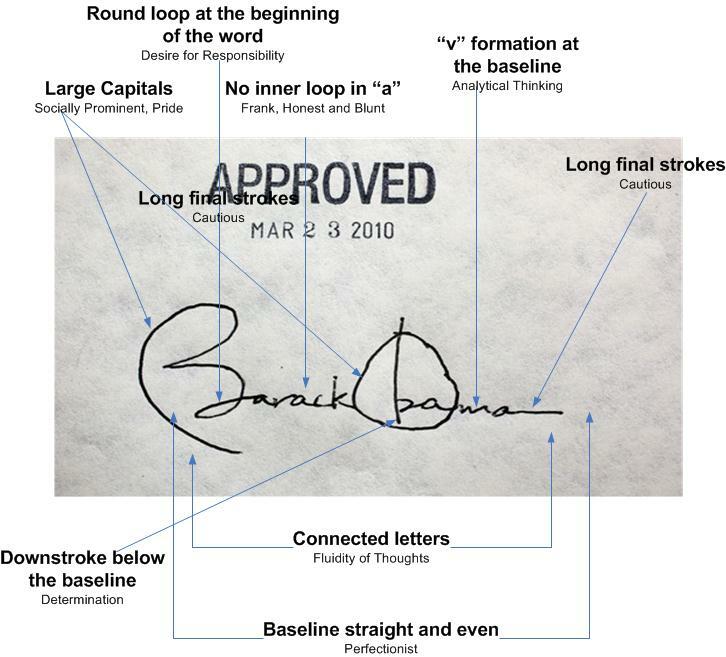 Barack Obama’s Signature shows Desire for Responsibility . This may sound a very obvious trait for a person who is arguably the most Powerful person on Earth, handling country as big as United States and many a crucial World affairs. This trait is important in a Leadership role which requires a person to take up responsibilities abruptly. Obama has a desire to be needed by a large number of people. A sneak peak into earlier days of Obama reveals that in late 1988, he entered Harvard Law School. He was selected as an editor of the Harvard Law Review at the end of his first year, and president of the journal in his second year. He has been wanting the responsibilities to do more from his early days. Obama has the need to be Socially Prominent , as someone of enormous stature. He wants to stand-out in public. He has this innate need to be famous. Obama has Immense Pride in self and his abilities also. He possess good deal of determination in his personality. 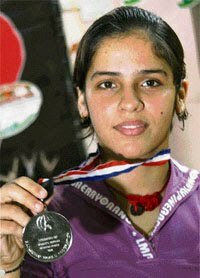 Determination is one positive trait that helps anyone achieve the goals one has set for self. Obama’s rise in the United States political scene is nothing short of a miracle. He was elected to the Illinois Senate in 1996 and he was President of United States by 2008. From being a State Senator to ruling United States in close to a decade is meteoric. Determination is certainly one of the traits that has helped him scale new heights while maintaining that burning passion. Obama is Cautious in his decision making approach. He always choose to be careful in order to minimize risks. The cautious tendency reduces any impulsive behavior and causes one to weigh pros and cons before making decisions. He uses his judgment and is ruled by head and not by heart especially in decision making. In his article in Washington Post by Joel Achenbach, he says- “President Obama is almost defiantly deliberative, methodical and measured, even when critics accuse him of dithering. When describing his executive style, he goes into Spock mode, saying, “You’ve got to make decisions based on information and not emotions. Obama’s style has been attacked from his left flank as well. Liberals have zinged him as being too cautious, too much of a compromiser.” More on Joel’s article here . He also possesses Perfectionism in his personality and that may be the reason i.e. to satisfy his desire for Perfection, some of his decisions take time but by general consensus are more articulate. Obama possesses Analytical Thinking in his personality. Many theorists label him as more Analytical than George Bush . A person with Analytical thinking ability weighs one fact against another, coming up with well-considered decisions. 4. The Book- “Say it Like Obama” authored by Shel Leanne. 5. The Book- “Handwriting Analysis- Putting it Work for You” by Andrea McNichol. >This is a news item that i was featured in. 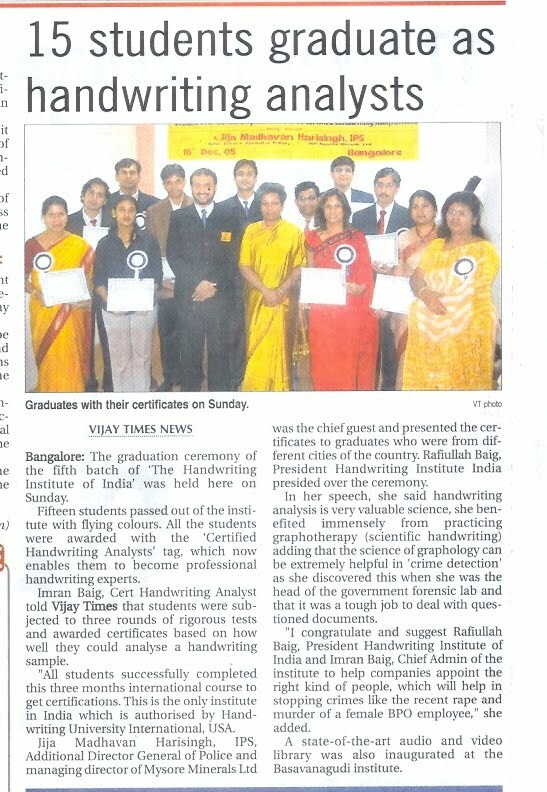 This stuff is not new, i think around December 2005 when i completed my Certification in Handwriting Analysis. Just thought to share through this medium. I am fourth from Right in the Picture. 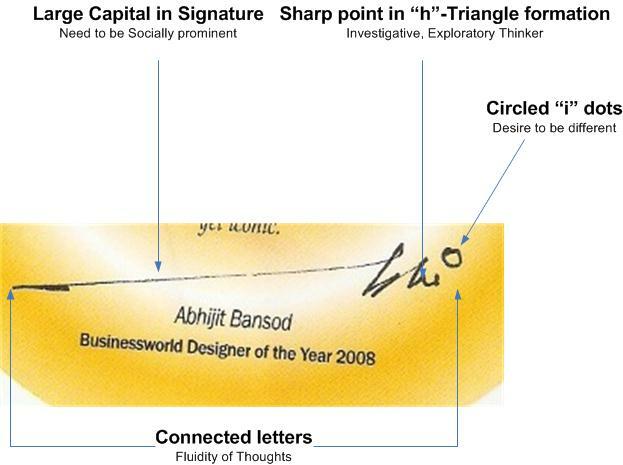 >What does Abhijit Bansod’s signature depict about his personality? – Abhijit Bansod is a quirky designer from India. – It was the vision of Abhijit Bansod that transformed Titan into a design-centric company telling genuine Indian stories. – He went on to Pioneer the uniquely Indian ‘Heritage’ and ‘Raga’ collections at Titan. – He now runs his own Product design company, ‘Abhijit Bansod Designs’ – or Studio ABD – a company specializing in product design and the ‘Indian Story’. – In less than a year, ABD has produced one iconic product: a table lamp for BPL called as StudyLite . – His creations won him NID Businessworld Designer of the year Award for 2008. Trivia: Among other notable products, ADB also designed the IPL trophy. I got this Signature Sample after i purchased one of the ABD creations, the StudyLite table lamp. 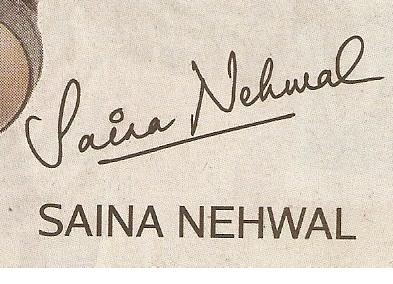 This Signature Sample was inscribed on a paper that came with the lamp. My general observation is that the Signature samples that also serves on the advertisement are not 100% same as the actual signatures because sometimes printing takes it toll ans also you cannot judge the pressure in such a situation. Also, my experience tells me that Signatures are best analyzed along with Handwriting sample. 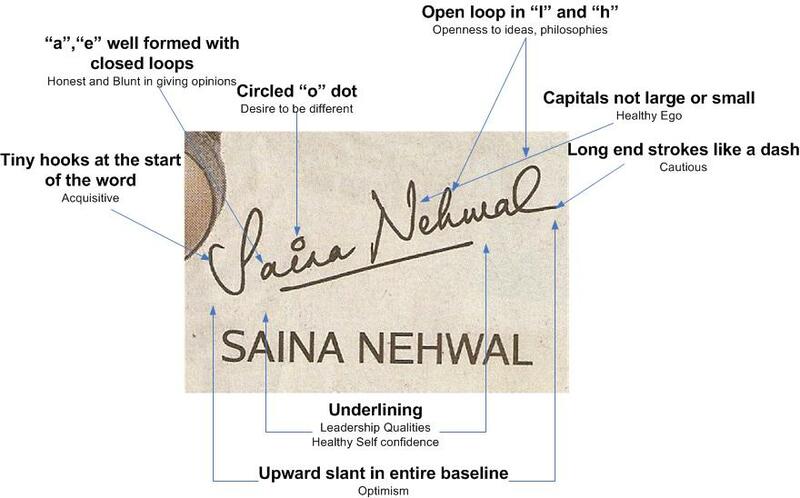 For example, one can derive more accurate meaning if you how is Singature sized as against the handwriting, how is it slanted as against normal handwriting, Also positioning of Signature gives some good information and there can be many more such insights that can be derived. So, had more information been available, the analysis would have been more elaborate. So, obviously Signature Samples from Such sources have some issues, which i think you would appreciate now. But nevertheless what is presented to you in this analysis is my best attempt and i hope you will enjoy the same. Abhijit Bansod has a Desire to be different . A person with this trait usually feels I have something that sets me apart from others and this difference is quite important to me. Given his closeness to India and its unique culture, he imbibed and used this differentiation in his Product designs which were so refreshingly Indian and gave him something that set him apart from the crowd. He really had this innate desire to do something different in his early days. Even for his Diploma project, he had approached Bajaj for doing People’s car in an auto riskshaw base. One of his first design intervention abhijit omelet in 1995 at NID campus is a big business today ! He possesses Fluidity of Thoughts in his personality. Fluidity of thoughts denotes the ability of a person to move from one thought to other or from one thought pattern to another with ease. This trait gives him immense ability to write or express his ideas with graceful fluidity. 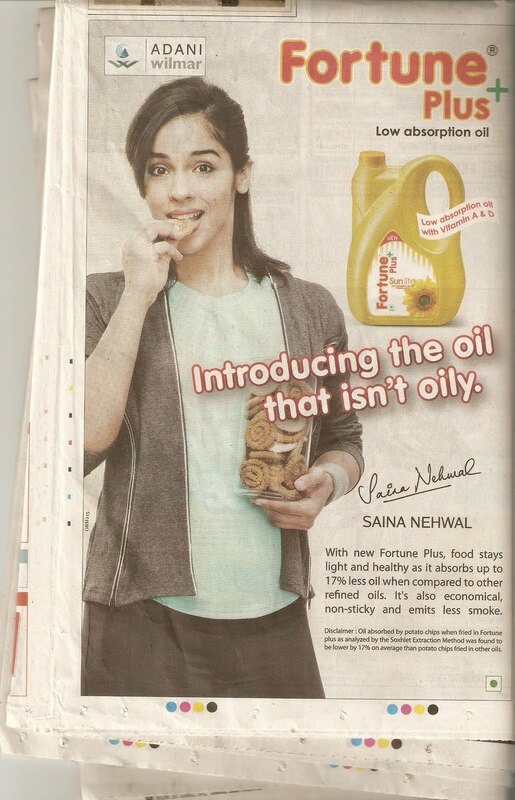 In a way Fluidity of thoughts is one of the prime personality trait if one were to create an Idea into a complete package that could be sold to customers. Most of the times people get wonderful Ideas but they fail to get productized sometimes because the ideas lack spark but generally because the idea lacks necessary fluidity to presented in a way that wins over the hearts, minds and souls of the people concerned. In case of Abhijit, as his Signature shows he possesses necessary fluidity. The one reason that he is sucesful is because of his unique blend of ideas tied closely with common man’s requirements (StudyLite) and Indian culture but one main reason is that he has this knack to deliver/communicate ideas in a way that leaves a lasting impact and this comes with fluidity of thoughts. In 2002, he designed Titan ‘Heritage’ collection of watches and then Titan ‘Raga’, which became hugely successful. Most of his designed products became hits after the successful story telling around the product by him and his team. He possesses the need to be Socially prominent , someone who is of big stature. He has a need to stand out from the crowd. He has a great deal of Self pride and this trait is something that is a fodder for people who are extremely passionate. The signatures of former US Presidents Ronald Reagan, Richard Nixon and Jimmy Carter also have this trait. This is one trait that has possibly helped Abhijit to really stand out and make a mark for himself in a field in which there are not many parallels in India. Afterall, historically Indian products were rarely associated with the terms like Sublime design. He is an Investigative and Exploratory thinker . Such a thinker thinks rapidly and has a desire to satisfy his many curiousities, is constantly inquiring , always curious about many things. Such people always are studying something new, something better and always seem to have a ready comeback in any argument.This trait goes well with Fluidity of mind and make a very potent combination. For his quest in learning something new- he studied Japanese design philosophy, Scandinavian design philosophy, Italian design philosophy before curious wondering whether there is anything called as Indian design philosphy. Something that he has strived to work to find answers for in his design creation. 1. The book- Connect the Dots by Rashmi Bansal. Some of the Introduction text and stories about his personality has been referred from this book. >Can handwriting determine how you cope with criticism ? >The personality trait- “Sensitiveness to criticism” primarily deals with how much a person lets him or her get affected by the way what others think or say. It can be termed as Fear of disapproval. – Such a person wants everyone to like him/her every time. – Such a person has a need for approval from others. – Such a person might get into the habit of reading between words and concluding that the other person has said a certain thing with the intention of criticizing him. – Such a person has an over-bearing need to be praised all the time. – Such a person has a tendency to be defensive when provided with a negative feedback. – A student criticized for showing poor results in the class, gets back in next exams with good results. Such a person knows how it feels like to be criticized and works harder not to be in same situation again. – For the people in Showbiz, the attitude of “Everyone should like me” is critical to success as such a belief prompts these professionals not to allow anyone to criticize their appearances. – In order to do his/her job better a salesman has to be sensitive to the needs of customers. There can be some other situations like these as well. Most of the personality traits have desirable facets as well as the undesirable ones. The transition from the desirable to undesirable ones happens over a fine line and the person has to be smart enough to know when he is crossing that line or Graphology can definitely help you judge that. >Can the presence of "Ego" be determined using one’s handwriting ? Ego is the self of an individual person. The self, especially as distinct from the world and other selves. Ego is one’s concept of onself. Is Ego necessarily a bad thing ? Ego is not necessarily a bad thing. Infact, it is in a way necessary for one’s survival. In other words, for humans to exist and flourish- it is necessary to have sense of self i.e. one’s Ego. However an inflated ego is a bad thing, even detrimental to yourself and relationships you may have. An inflated ego is when you believe the world revolves around you. “Ego can be either good or bad. If you have an ego, than you must control it and not let it control you. You must have enough ego to have self confidence and to get noticed, but not to the point where people roll their eyes when you enter a room. Having an ego is akin to breathing. If you are a human being you will have an ego, whether one likes this statement or not. It helps one create a Self image and hence is a reflection of self confidence as well. So, having Ego is not a bad thing at all. The problem usually begins when your Ego inflates and overtakes you. A healthy ego is one where good self-esteem reigns. What this means is that there are little to no insecurities about one’s real feelings of worth so there would be little reactivity when the outside world challenges one. A healthy ego does not have to negatively react, defend, justify, rationalize, fight, manipulate or hide from challenges because it is convinced that whatever is going on outside will not change who one is and what one stands for. Conversely, an unhealthy ego is one where low self-esteem reigns. There are continual feelings of discomfort/shame with oneself and no real trust in oneself or one’s abilities. The person with the unhealthy ego typically hears negative self-talk which is unsupportive and frightening since it gets its source of information from what one truly feels about themselves. They can also feel exaggerated ideas about themselves, such as grandiose ideas about how wonderful and exceptional they are to the point of being conceited and arrogant and can also believe that they are beyond reproach, responsibility or consequences. Most personas with unhealthy egos are difficult to get to know or have intimacy issues because of their fear of really being found out. Their self-loathing has superseded their feelings of self-love. An Egoist’s attitude towards life is simple and direct. Every decision such person makes is based on the answer to one question- “What’s in it for me ?” He has this selfish, greedy and rutheless desire for self-advancement and if that hurts anyone, so be it. An Egotist has all the traits that define an Egoist but with a big mouth. An Egotist is boastful to an extent of being obnoxious. Egocenteric is an extreme form of Egoist. He considers himself center of the universe. Egomaniac carry egoism to such an extreme that his needs, desires and interests have become an morbid obsession, a mania. Can handwriting determine “Healthy” ego ? In Handwriting, it is represented by Capitals that are approximately twice the middle zone. Self-esteem is the total value one gives to self. The National Association for Self-Esteem defines self-esteem as “The experience of being capable of meeting life’s challenges and being worthy of happiness.” People with healthy egos give just enough importance to self and dont exaggerate the same. In Handwriting, Self esteem is represented by positioning of “t” horizontal bar in the “t” stem. The higher the horizontal bar on the stem, the greater the self esteem. People with Healthy Egos exhibit Pride in their positive achievements. In Handwriting, Pride is seen in letters “t” or “d” wherein the stem of these letters is around twice more than the middle zone. People with Healthy Egos do not generally tend to be defensive and reactive to other’s thoughts towards themselves. They exhibit certain contentment. In Handwriting, to my knowledge there is no one trait that shows Lack of defensiveness. I think well balanced and retraced “t” bar with horizontal bar perfectly balanced and stem retraced is one indicator. I will cover this more in my forthcoming posts. Can Handwriting determine “Unhealthy” ego ? In Handwriting, it is represented by Capitals that are approximately four to five times the middle zone. People with Unhealthy ego do not put right value to themselves, their efforts. In Handwriting, Low self esteem is represented by “t” horizontal bar being placed very low i.e. in lower part of middle zone. People with Unhealthy Ego exhibit Excessive Pride in themselves,which in a sense is a false pride. In Handwriting, Vanity is exhibited in “t” and “d” stems being four, five or even more times taller than the middle zone. People with Unhealthy ego are vulnerable to other people criticising their ideas and thoughts. By being sensitive they form a sort of false defense mechanism. 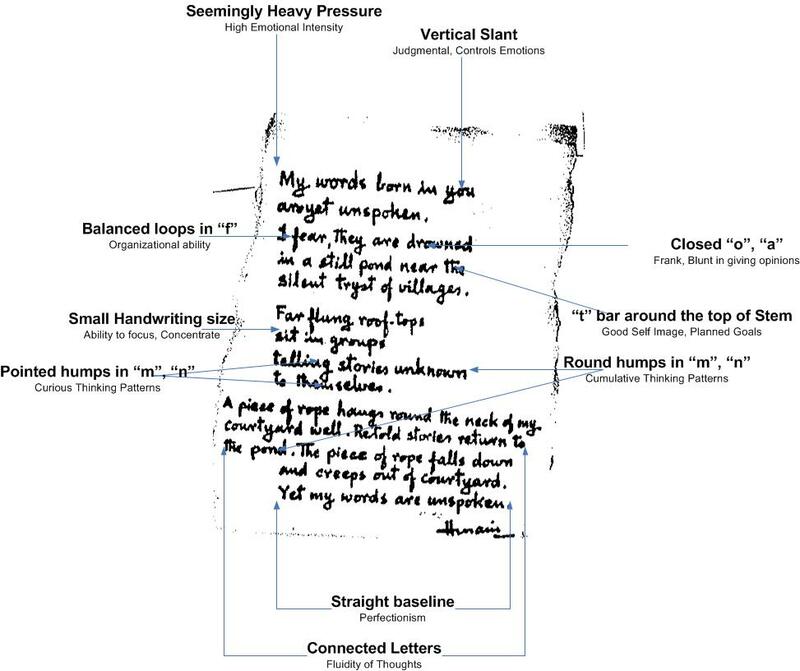 In handwriting, Sensitive to Criticism can be judged by loops in “t” and “d” stems. A person with Unhealthy ego may tend to deceive himself of the real facts. He may live in make-beleive world, where he can chose to ignore facts no matter how convincing they would be, just to satisfy his ego and false sense of self. In handwriting, the Self Deceit is generally shown by letter “o” with a loop on the left hand side. People with unhealthy ego are generally unpleasant and may tend to be assertive in forcing his views and authority on others, being domineering. In handwriting, Domineering tendencies are seen in letter “t” with horizontal bar slanting downwards and with sharp ends (indicating sarcasm with dominance). – An “Egoist” will generally have some or all of above traits of Unhealthy ego. 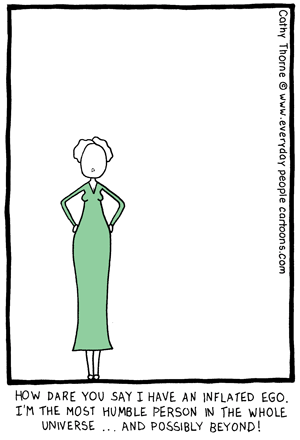 – An “Egotist”, in addition to above traits will be more talkative (In handwriting, “o”, a” loops will have an opening). – An “Egocenteric” person, in additional to all above traits will be talkative and argumentative (In handwriting, shown by break-away “p”) i.e. he might use unnecessary arguments to prove his Ego centeredness. – An “Egomaniac” person, in addition to being Egocenteric might be emotionally unstable and unpredictable (shown by variable slant handwriting).